It’s been a rollercoaster ride for Kirst, who graduated from Corcoran in 2009 and now productively spreads himself thin as a freelance writer, social advocate, stand-up comedian, and podcast and web-show host. Kirst has come a long way in his five years of sobriety. His dad, who helped edit his book, couldn’t be happier. “It was frightening the first time we discovered he had a problem, but since he got sober, everything has been easier,” his dad added. Sean Kirst said he would travel miles to be with his son in his moments of vulnerability and weakness. He was also the one who pointed out his son’s imbalanced personality as a senior at Corcoran in his quest for valedictorian and his incessant revelry. Seamus delivered the valedictorian speech in 2009 and continued to lead two lives as an A-plus student by day, and a substance abuser by night. According to the National Institute on Alcohol Abuse and Alcoholism, over 600,000 adolescents aged 12 to 17 suffer from alcohol use disorder, and an estimated 88,000 people die from alcohol related deaths annually. Seamus knew he did not want to be one such fatality and looks back to August 2013, when his life changed for the better. It was a bleak summer morning in New York City. He had blacked out the night before, woke up and called his parents to tell them he decided to permanently quit drinking. It certainly wasn’t easy, but Seamus is now confident in his “new normal,” as he describes life since. He sifts through his planner and sips his coffee at a Pret a Manger in Manhattan. It’s a cool Monday morning and he goes back to a defining moment in August 2015 when he first published a 1,600-word essay on his experiences with substance abuse on his blog. The essay was republished in The Scribbler in India and in The News Lens International in Taiwan, two places he had spent time. For a taste of that wackiness, consider the name of his two cats: Bernie Sanders and Sugar Baby. Seamus must be focused as he works on his various projects: crowd-funding his comedy web series on finding love as a gay man in the modern world, awaiting publication of his picture book and launching his podcast on entering the entertainment world. 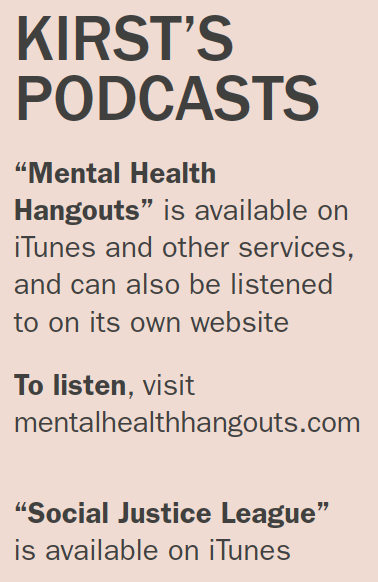 Lily Gildor, co-host of Seamus’ first podcast, “Mental Health Hangouts” and a classmate at Brown, says Seamus is dedicated to his work, and fun to work with. Seamus is quietly working on two more picture books, one for middle schoolers and one for adults. He continues to freelance on politics, entertainment and mental health for publications including Huffington Post, Vice, The Washington Post, Mic, Them and more. His mother, Nora Kirst, looks back on that morning in 2013, when her son announced his call to sobriety for the first time. “It will remain one of the most memorable moments,” she said. All she could do was be there for her child. “My mother even paid for my therapist when I was recovering and has helped me in so many ways,” Seamus said.